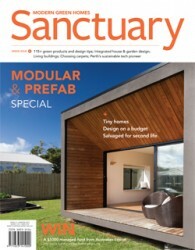 Sanctuary is Australia”s only magazine dedicated to sustainable house design. SKU: S31. Category: Sanctuary. Tag: Energy Efficiency. As well as being an architect, Joe Chindarsi is a pioneer of new technologies. His latest home in North Perth is an exemplar of sustainable design. A lightweight, modest extension has transformed the living space of this inner Sydney house and made entertaining much less awkward. Relocating an original Brunswick cottage to historic Chewton allowed the perfect blend of old and new, and plenty of scope for reuse. A northern addition to an art deco bungalow in Melbourne’s north makes the most of natural light and the garden, while being generous to the street. Often gardens play second fiddle to the house design – a deck and a vegie patch tacked on once the build is accounted for and if any budget remains. Free Range Food gardens permaculture landscape gardener Gordon Williams makes the case for an integrated approach. Modular and prefab construction cuts down on waste, time and money, with factory-controlled production for guaranteed performance. What role does it play in sustainable housing? 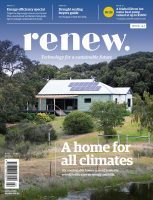 Synonymous with the more-with-less, alternative, affordable home campaign in the US, the Tiny House Movement is growing in Australia, with obvious green appeal. Working with salvaged materials is labour-intensive, and often doesn’t come with the savings imagined. But it can add character, history and plenty of satisfaction, as committed reuse architect Emma Scragg explains. Caroline Pidcock introduces a building standard that goes several steps beyond basic passive solar performance and energy-efficiency, aiming to diminish the gap between current limits and ideal solutions. Australia’s cities are growing at a rapid rate, with projected population increases demanding dramatic changes to the way we design and live in them. Dr Fiona Whitelaw considers shared living, in varying degrees, as one response. Peter and Alison are looking towards retirement, seeking the good life and new sustainable home in country southern Queensland. They have done their research and are committed to a low-budget, small-footprint home. Architect Stephanie Skyring offers a possible design solution. While rustic floorboards and polished concrete have long been the mainstays of sustainable design, carpets are still often used in bedrooms for their softness and insulating qualities. Interior designer and healthy home expert Melissa Wittig helps you tread the woven path.